Jack Dorsay was the man behind the start of twitter in 2006. It took to the world and the world responded with tweets to tweople all around the globe. As far as I know, there has always been this idea of "following" another profile. An action that simply means, you like the persons content and wish to see more. Opt-in and completely out of free will. 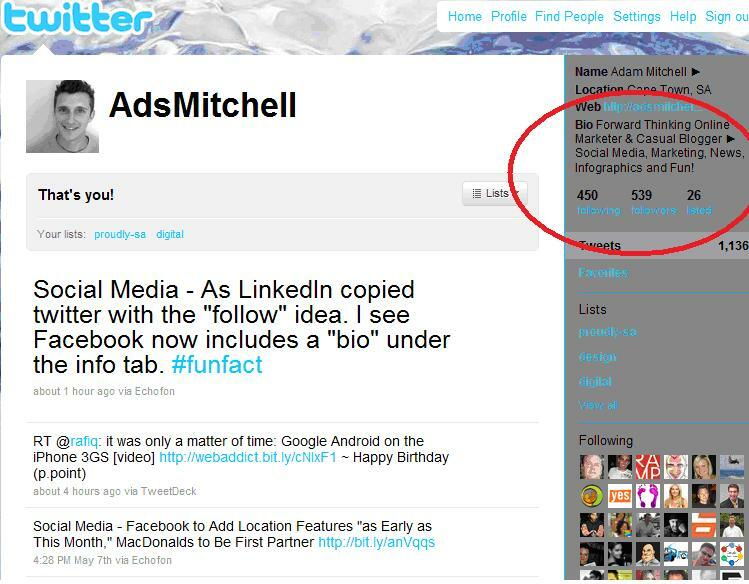 Twitter has also always had a "bio" field. A space where you can write and display a brief summery of yourself. 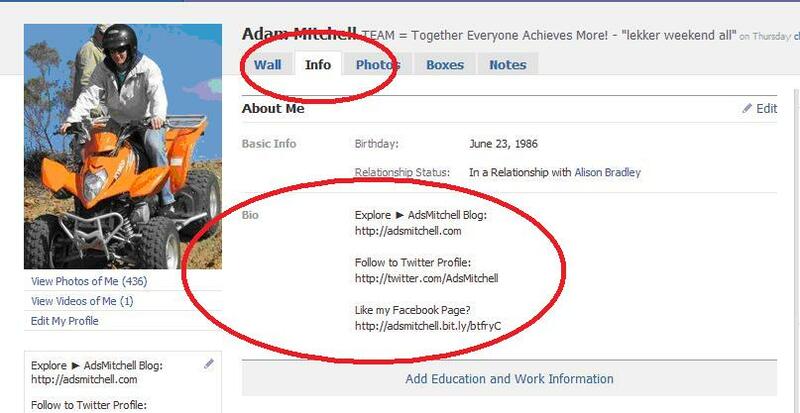 See the red circled areas on the screen shots. Earlier this year, professional social media platform, Linkedin introduced the "follow" concept. 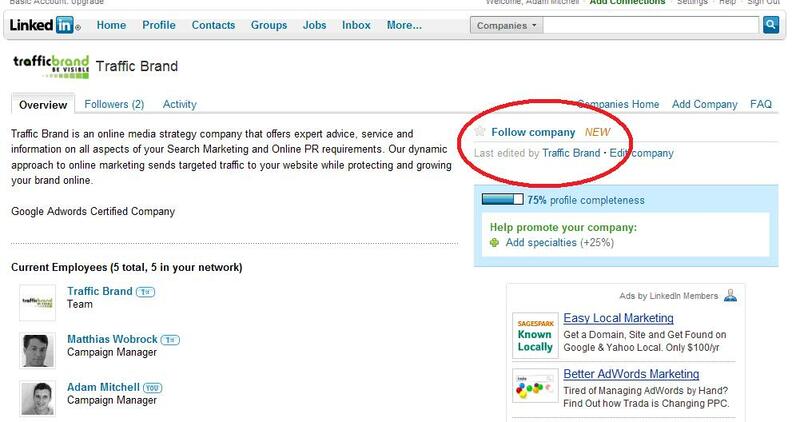 Companies on Linkedin can now be followed, just like you would on twitter. With a person profile on Linkedin you add the person to your network. 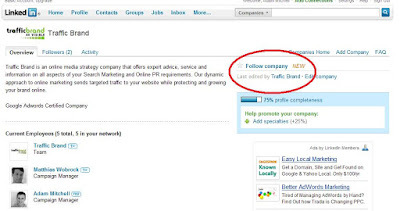 When searching company profiles, you would "follow" them for updates on recent activities. Facebook recently implemented the "like" button, instead of "become a fan". I think apart from the targeted advertising, it is another theme followed from twitter. Easy to engage with simple clicks. A similar pattern to the "follow" vs "friend request". However, Facebook has always allowed you to fill in a small paragraph under your profile picture. I think it says, "write something about yourself". If you fill this in, it will also appear under your info tab as a bio. This, I noticed on Sunday evening and is what inspired this post. Many people on twitter view a persons bio as a determining factor when deciding to follow. An intriget part for twitter, but I don't think it has the same value on Facebook. It is duplication, as it is displayed down the left hand column too. All of the above are recent observations of mine that illustrate how twitter has had an influence on other social media networks. They say copying someones ideas & creations should be taken as the biggest form of flattery. So the team at twitter should be smiling!